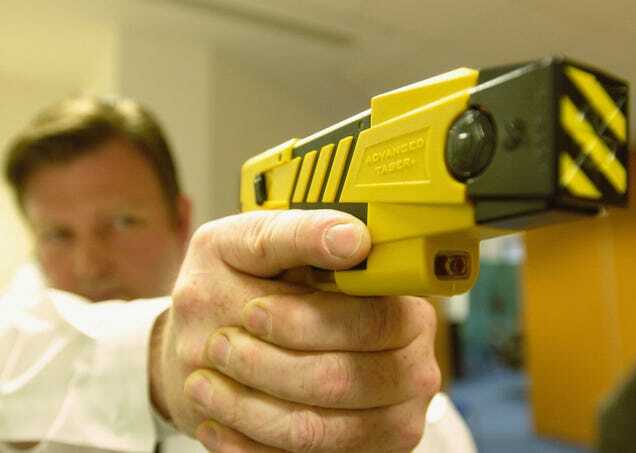 A policeman holds the new advanced taser gun April 4, 2003, as the Metropolitan police introduced the Taser gun to the press in London. In what has become a subplague in the epidemic of police violence, two police in West Milwaukee, Wis., will not be charged in the death of a 22-year-old man diagnosed with schizophrenia, whom they tased more than a dozen times. On Friday, Milwaukee County District Attorney John Chisholm opted not to bring any charges against West Milwaukee Police Officers Michael Rohleder and Anthony Munoz, who on May 25 responded to a call at an apartment building known to house those with psychiatric disabilities. There, they encountered Adam Trammell, who ended up battered and dead after the encounter. USA Today describes the altercation, in which Trammell suffered a black eye, a broken rib, and more than two dozen cuts and bruises. On the officers’ bodycam footage, Trammell can be heard screaming in agony. The medical examiner’s report ruled the manner of Trammell’s death as undetermined but cited the stun gun use—as well as the use of sedatives by paramedics—as a contributing factor. Trammell’s last day on earth was set in motion the morning of May 25, 2017, when a neighbor called police because Trammell had knocked on her door and was naked in the hallway, talking about the devil and his brother. Trammell had not threatened anyone or brandished a weapon, according to reports, but when the police arrived, the neighbor reportedly told them she feared that the young man was experiencing a psychotic break, and might harm himself. Trammell’s downstairs neighbor also told them that water was leaking through the ceiling from his apartment. Rather than waiting for 25 minutes for someone to arrive with a key, police broke down the door and walked through the apartment to the bathroom, where they found Trammell taking a shower. When the officers spoke to Trammell, he stared at them and did not reply. Munoz reached for Trammell, who pushed him away. That’s when Munoz first deployed his stun gun, causing Trammell to fall backward into the tub. After initially lying still, Trammell struggled as Munoz and Rohleder tried to handcuff him, so they tased him again. Rohleder pulled the trigger of his Taser one more time from the hallway, while the leads to its wires were still embedded in Trammell’s body. Rohleder told investigators “this was not an intentional deployment, but occurred spontaneously when the West Allis police asked him if the Taser wires were still connected,” according to Chisholm’s letter. By the time paramedics got him into the ambulance and gave him two sedatives—ketamine and midazolam—Trammell had stopped breathing and had no pulse. He was pronounced dead within minutes of arriving at the hospital. The medical examiner listed the cause of Trammell’s death as excited delirium, a controversial condition often cited when police use force. DA Chisholm concluded that there was “no basis to conclusively link” the death of Trammell to the officers’ actions, as he noted in a letter to West Milwaukee Police Chief Dennis L. Nasci. Chisholm also said that the officers were not abusive, something the young man’s father cannot accept. A recent white paper released by the Ruderman Foundation revealed that half of all police killings in the U.S. involve people with disabilities, the most common being a psychiatric disability. Many of those killed by police are unarmed, and mental health advocates say customary tactics rarely de-escalate the situation, oftentimes using lethal force, especially if they are African American.